Like all our books, this one has features that you won’t find in competing books. That’s why we believe you’ll learn faster and better with our book than with any other. Here are a few of those features. If you page through this book, you’ll see that all of the information is presented in “paired pages,” with the essential syntax, guidelines, and examples on the right page and the perspective and extra explanation on the left page. This helps you learn faster by reading less...and this is the ideal reference format when you need to refresh your memory about how to do something. Of course, this book also presents dozens of short examples, so it’s easy to find an example that shows you how to do what you want to do. Even better, our paired pages make it much easier to find the examples that you’re looking for than it is with traditional books in which the examples are embedded in the text. Like all our books, this one has exercises at the end of each chapter that give you hands-on experience by letting you practice what you’ve learned. These exercises also encourage you to experiment and to apply what you’ve learned in new ways…just as you’ll have to do on the job. 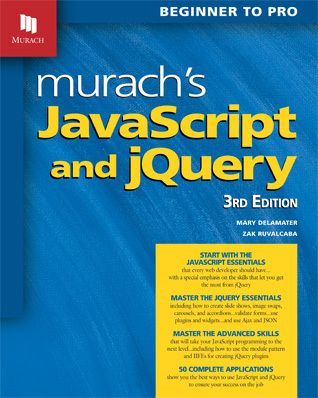 Remember too that this book will work for you whether or not you have any programming experience. Although you can use any text editor with this book, a text editor that includes syntax coloring and auto-formatting will help you develop applications more quickly and with fewer errors. In the book, we recommend Aptana Studio 3; however, it’s no longer supported and has become hard to install. To test a web page, you can use the default browser on your system. But we recommend that you also test your pages in Chrome, which includes a terrific set of developer tools. Appendix A provides a procedure for installing Chrome, and chapter 5 shows you how to use Chrome for debugging. “If you are new to web design or an old pro like me, this book is a must-have in my opinion. I love how it starts out with the basics and then moves on to the good stuff. Each chapter is full of examples and sample code showing you how to do the most common techniques that you will face as a web developer/designer. - Alan Vogt, ETL Consultant, Information Builders, Inc.
To get a better idea of how well this book works, you can download a chapter in PDF format. As you will see, the approach in this book works for programming novices as well as for experienced programmers. Appendix A in the book shows how to install and use these files. Then, if you have any questions that aren't answered here, please email us. Thanks!